Twice a year the application to be mentored by someone on the LISM Mentorship Team opens. If you’ve been in youth ministry for 5 years or less, don’t miss this FREE opportunity! Some of the Life In Student Ministry Mentors and myself collaborated on Google Wave about a year ago to put together a list of reasons why everyone in youth ministry needs a mentor. If you’ve been in youth ministry for 5 years or fewer, the Life In Student Ministry Mentorship application is currently open until January 30. Check it out if you’d like to have 10 weeks of one-on-one mentoring from a veteran youth worker for absolutely free. But even if you’ve been serving in youth ministry for 20 years, you still need a mentor. Here’s why. 2. Accountability: Share your goals with someone who will help hold you accountable for them. If you don’t yet have any goals or direction in ministry, a mentor can help you think through them and flesh them out in practical ways. 3. Support and Encouragement: A mentor wants to help you thrive in ministry. They listen to you, support you, encourage you, and give advice about your current situations and how to handle them. You can vent, even kick and scream when appropriate, and ask tough questions without worrying about losing your job. 5. A wealth of knowledge: A mentor can have the expertise, the experience, and the knowledge of ministry. They’ve been living with the tension of intertwining ministry, a personal life, and a growing relationship with Christ for many years. They know what you’re going through and can help you navigate it all. 6. Networking and resources: A mentor can direct you to other people who specialize in something that pertains to your ministry. They often know what resources to recommend and can point you in the right direction. 7. Receive validation: When many people in your church view the youth ministry as a glorified babysitter or some kind of spiritual superman that’s supposed to fix every kid, a mentor can provide some validity for what you do and why you do it. And they can also give input about how to start shifting that perspective of youth ministry. 8. Experience and Education: Mentors often have experience and more education (even if not formal education) to be able to share from, refer to, and use to encourage you. 9. Someone to ask the hard questions: Everyone needs people in their life who are further ahead than they are. A mentor who’s been in ministry longer than you can help correct some trails that are heading the wrong direction in your personal life, spiritual life, and in your ministry. QUESTION: Why else does every youth worker need a mentor? Let us know in the comments below! 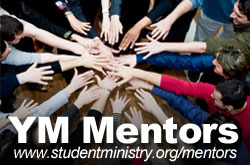 Get a FREE one-on-one youth ministry mentor! Do we pursue others for Jesus for selfish reasons?